Initially we performed only basal elevation osteotomy in the 1st metatarsal and we observed the limits of this procedure - i.e. some transfer metatarsalgia on the 2nd and 3rd ray, or on the contrary, insufficiency of Ml elevation. However we observe the good results with this osteotomy regarding notably the correction of the rear foot varus; since we can now easily perform basal osteotomy elevation in the lesser metatarsals, we can elevate the 1st metatarsal as far as necessary, and combine with BRT osteotomy on the lesser metatarsal as required. The combined procedures we use are the equi-nism correction by Achilles tendon lengthening or gastrocnemius proximal desinsertion. The cal-caneum osteotomy can be performed, this kind of extra-articular surgery was recently emphasized by J. Sammarco. For mild and moderate pes cavus - i.e. 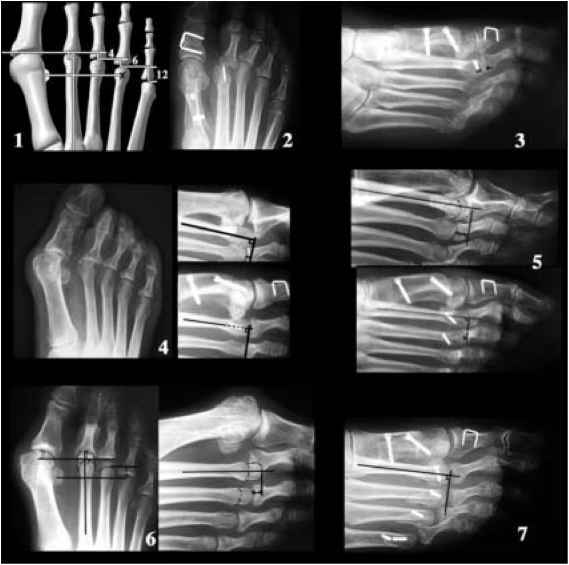 the main cases encountered - the calcaneum osteotomy combined with BRT osteotomy and distal extra-articular correction of claw toe (mainly by soft tissue procedure and K-wiring of the toe) appear to be an excellent solution of the problems of pes cavus. The Weil lesser metatarsal osteotomy is a reliable solution only in pes cavus with severe claw toe. For the other cases, the BRT osteotomy gives good results: the two procedures may be also combined. Fig. 18d1. Pes cavus BRT osteotomy of the 1st metatarsal. 1, 2, 3. The excess of plantar slope of the 1st metatarsal, which contributes to give a rear foot varus, can be corrected by the BRT osteotomy, as a consequence of correction of the forefoot supination. 4. Intraoperative aspects. We note that the wedge to be removed is larger than for the lesser metatarsals. 5. Post operative ray with fixation by the "20" memory staple (use of two staples is preferable). This staple may be also used in the fifth metatarsal. Fig. 18d2. Pes cavus and BRT osteotomy 2. Some problems resulting for isolated 1st metatarsal osteotomy. 1, 2. Excess of MTP dorsal flexion. 3. Correction by secondary MTP surgical release (1 year). 4. Too much elevation of the 1st metatarsal: Transfer metatarsalgia on the 2nd ray. 5. Good result after performing BRT osteotomy on the 2nd and 3rd metatarsals. 6. Now, in case of large elevation of the 1st metatarsal, we perform in the same time the required elevation of the lesser metatarsals. Fig. 18d3. Pes cavus and BRT osteotomy. Treatment of metatarsalgia and claw toes in pes cavus. 1, 2. Operative views: We perform BRT osteotomies as required on the corresponding metatarsals, combined with tendons lengthening (extensor, flexor tendons) and toes K-wiring. 3, 4. The same foot four months after the operation (right foot operated on). 5. Standing sagittal X-ray preoperative and four months after the operation. Fig. 18d4. Pes cavus and BRT osteotomy. Revision after Weil osteotomy. 1. Sometimes, pes cavus is not a good indication of single Weil lesser metatarsal osteotomy. 2. Same foot, correction of recurrent hammertoe and metatarsalgia by BRT osteotomy. In severe claw toe observed in pes cavus, the best way is to combine Weil and BRT osteotomy.